*Our Seniors played Newry Mitchels in the quarter final of the Junior Championship in Mayobridge last Monday evening. The Fin dominated the opening 25 minutes of the game to take a 1-08 to 0-00 lead. Mitchels got a goal and a point back before half time before the Fin went on to win the game 1-13 to 2-07 to book a place in the semi finals for only the fourth time in fourteen years. The opposition in the semi final will be Kilclief and the game will be played this weekend, time and venue to be confirmed. *Our seniors also completed their league programme with a home game against the already confirmed league winners Teconnaught. With a few players resting up injuries and another few unavailable Teconnaught recorded a facile win. Now all thoughts are on the upcoming semi final. *Our U14’s good form of late continues after they accounted for Dundrum in the semi final of the championship. They will now meet Bright in the final which is a repeat of the league play off match up which the Fin won by a kick of the ball. Another close contest in the offering on Saturday 29th September. *Our U11’s are away to Kilclief this Wednesday at 6.30 pm and they are also away to St John’s this Sunday at 11 am. *Our U13’s have been drawn in a group with St Pauls and Carryduff B in the championship which will commence Sunday 14th October with an away fixture against St Pauls with Carryduff the visitors to Pairc Baile Anna on Sunday 21st October. The top two teams progress to the semi finals. 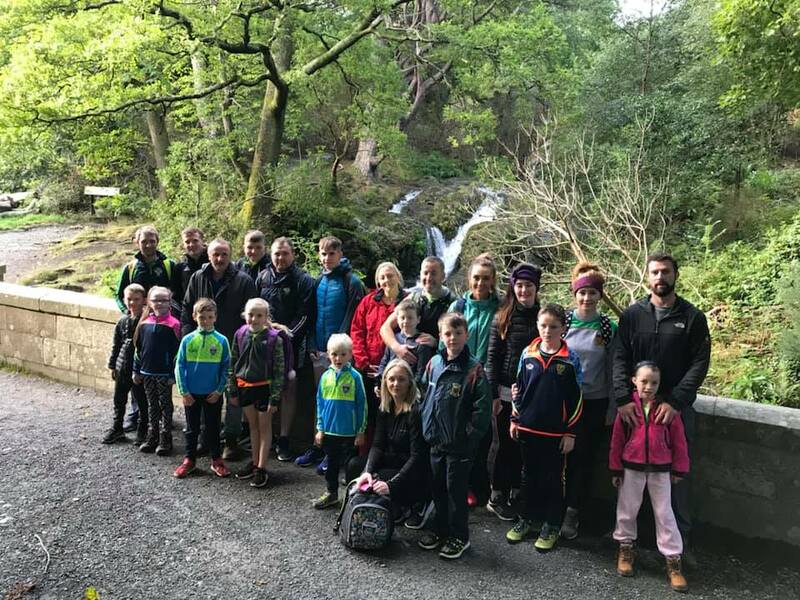 *The Donard Summit Challenge was a brilliant days craic with 23 adults and children taking up the challenge. The group made it up and down within 4.5 hours. Well done to everyone who took part and thanks to the generosity of our sponsors. *Our Wild West themed night will be held in Annsborough Club this Saturday. Admission is £10, those in fancy dress get a £2 concession. Music by DJ B. Doors open 8.30 pm, late bar. *The Annual Club Dinner & Presentation Night will be held in Downshire Arms in Hilltown on Saturday 27th October. Jenny Quinn is the point of enquiry for purchase of tickets. *The Juvenile Presentation Night will be held on Friday 19th October at 7 pm. *Lotto numbers 8, 13, 15, 25. No winners. Jackpot £3,775.